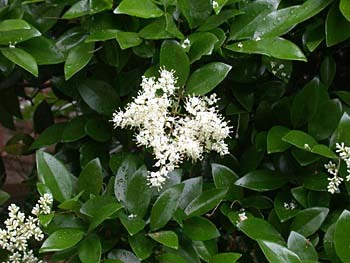 A commonly planted evergreen small tree that is an uncommon escape from cultivation, less invasive than the similar Glossy Privet (Ligustrum lucidum) and much less invasive than Chinese Privet (Ligustrum sinense). 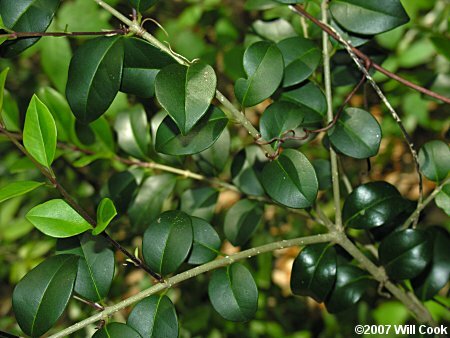 Distinguished from most other Ligustrums by its large, thick, glossy leaves and usually glabrous twigs. 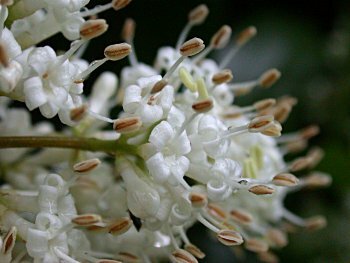 Very similar to L. lucidum, which has larger leaves (6-15 cm vs. <6 cm long for L. japonicum). A tip to tell the two apart: L. japonicum leaves snap when bent, L. lucidum leaves usually just bend. The flowers are sickly sweet -- somewhere between sweet and malodorous. The corolla tube is just slightly longer than the lobes (it is shorter in L. lucidum). Copious amounts of fruits are produced. The berries turn black when ripe and are eaten by birds.